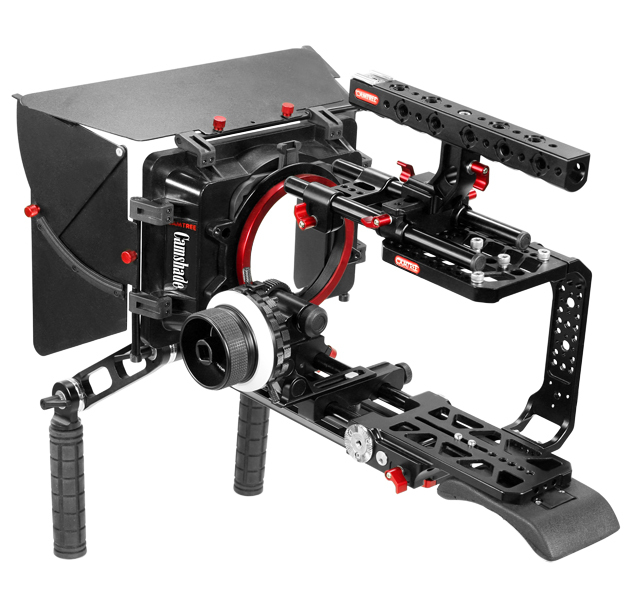 A Professional camera always needs a professional support system for enhanced functionality with high performance and for that we have launched Camtree Hunt Camera Cage Shoulder Kit for Blackmagic URSA Mini 4K/ 4.6K/ / Pro 4.6K (CH-BMUM-SK). It's Rock Solid handle ensures easy carrying & supports mounting of various accessories. Hollowed-out design significantly cuts the weight down, still with all the mounting points you can attach your accessories securely and easily. This comprehensive package includes a fully functional matte box for cinematic shots & a durable follow focus for accurate focus pulls. Masterfully engineered Camtree Camshade Camera Sun Shade with its endless features and robust construction enables the user to get cinematic effects. It is completely adjustable and can be altered according to the requirement. The video matte box is 15mm rod mount compatible & easily attached to any 15mm rod mount camera set ups. It is a masterpiece with quality worked upon and a perfect companion for your kit. Our zero backlash, metal crafted, quality Flip follow focus is a single-sided follow focus with a variable lock system and a base that slides to accommodate different lens constructions. It gets clamped to 15mm rods via tightening mechanism controlled by underside knob and offers integrated hard stops for quick focus racking between two focus points. The flippable gearbox adjusts the drive gear front and rear and is compatible with lenses of any size.